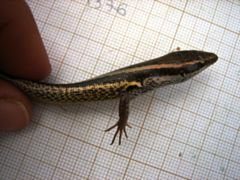 A comprehensive taxonomic revision of the Cape Verdean skinks is proposed based on an integrative approach combining (i) a phylogenetic study pooling all the previously published molecular data, (ii) new population genetic analyses using mitochondrial and nuclear data resulting from additional sampling, together with (iii) a morphological study based on an extensive examination of the scalation and colour patterns of 516 live and museum specimens, including most of the types. All Cape Verdean species of skinks presently recognised, formerly regarded as members of the genera Mabuya Fitzinger, 1826 and Macroscincus Bocage, 1873 are considered as members of the Cape Verdean endemic genus Chioninia Gray, 1845. The new phylogeny and networks obtained are congruent with the previously published phylogenetic studies, although suggesting older colonization events (between 11.6 and 0.8 Myr old), and indicate the need for taxonomic changes. Intraspecific diversity has been analysed and points to a very recent expansion of Chioninia delalandii on the southern islands and its introduction on Maio, to a close connection between Chioninia stangeri island populations due to Pleistocene sea-level falls and to a generally low haplotypic diversity due to the ecological and geological characteristics of the archipelago. Three new consistent morphological synapomorphies supporting two of the four main clades of the genus have been identified. The complex taxonomic status of Euprepes fogoensis O’Shaughnessy, 1874 has been resolved and a lectotype has been designated for this species; Chioninia fogoensis nicolauensis (Schleich, 1987) is elevated to species rank, whereas Chioninia fogoensis antaoensis (Schleich, 1987) is now regarded as a junior subjective synonym of C. fogoensis. Additionally, one new subspecies of Chioninia vaillanti and two of Chioninia spinalis are described (C. v. xanthotis ssp. n., C. s. santiagoensis ssp. n. and C . s. boavistensis ssp. n.) and a lectotype has been designated for Mabuia spinalis Boulenger, 1906. Finally, an identification key for the Chioninia species is presented.